The CoffeeShop Blog: CoffeeShop Photographer Storyboard Set #31! CoffeeShop Photographer Storyboard Set #31! Today I wanted to share a set of simple, modern storyboards (similar to design to my newest Facebook cover set) that you can print or put up on your website. 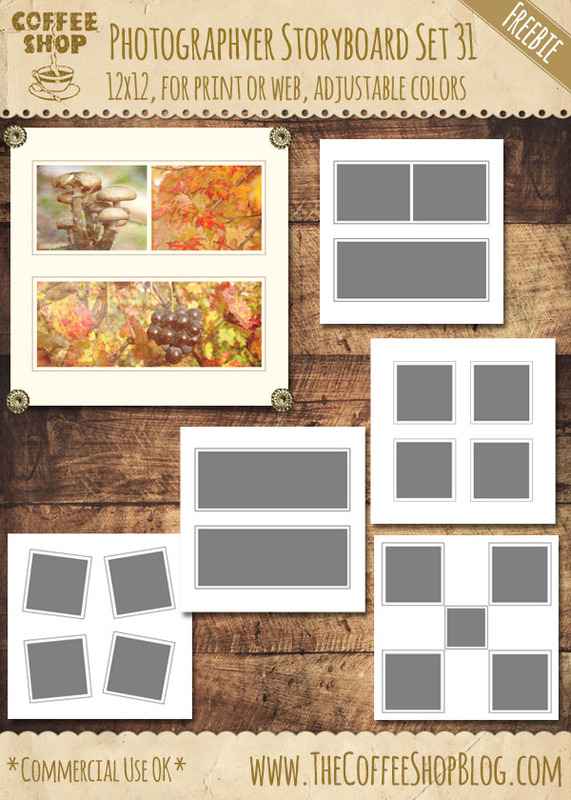 These storyboards are 12x12 and have clipping masks so you can easily add your own images. You can also change the background and frame colors or add a texture/digital paper behind the frames. I love the simplicity of these photographer storyboards. If you are new to clipping masks and need a tutorial or want to download my really helpful "Group It" action to make loading storyboards a breeze, please visit this post. If you love my storyboards you can download all of my favorites (including this set) in one simple download and help support my blog. Thanks to my wonderful readers and sponsors I can keep blogging and posting my freebies here on The CoffeeShop Blog. I love my job!!! Download the CoffeeShop Storyboard Set #31. You can also download it here. These are so pretty. You're such a sharing and giving person. Thank you.